All of our carcasses are manufactured from 18mm high-density MFC, including our adjustable shelving. Glue and biscuit/pocket joint construction. Base unit supplied 560mm deep with a 50mm service void. Wall unit supplied 320mm deep with a 12mm service void. Solid pocket joint and buscuit construction. 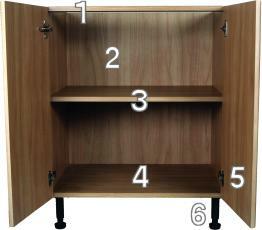 Various standard width base and wall units. Soft-close drawer boxes and hinges can be fitted. Wall units are supplied with hidden adjustable hanging brackets.